Have you set your goals for 2018? 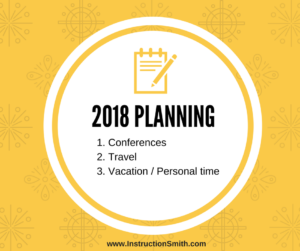 Planning ahead will save you time and help you be more productive. Prioritize your goals for the year. Be specific about why you want to realize these top goals then make a commitment to achieve those goals. A lot of people find it helpful to use a full year calendar. That way it is easy to see a complete timeline of not only your goals but also important deadlines, holidays, vacations, business travel and conferences. Being able to see your plans for the entire year makes it easier to adjust because you can see all 12 months in front of you. Because attending seminars, workshops and conferences demonstrates commitment to continued education and personal growth we put together a list of a few conferences coming up in 2018 we thought you might be interested in knowing about and possibly attend. Attendees will join with 100+ presenters and fellow writers from across the country and around the world at this year’s event. The SFWC events are consistently rated among the top writer’s conferences anywhere. Our goal is to help writers become published authors as we help them become better at the craft and business of writing. The SFWC is also one of the friendliest conferences. The event spans four days…plus open enrollment Pre/Post Event Master Classes! If you are working on your book, getting ready to publish it, or looking for ways to promote an already published book, this is the event you need to attend. The 2018 AWP Conference & Book fair is an essential annual destination for writers, teachers, students, editors, and publishers. Each year more than 12,000 attendees join our community for four days of insightful dialogue, networking, and unrivaled access to the organizations and opinion-makers that matter most in contemporary literature. The conference features over 2,000 presenters and 550 readings, panels, and craft lectures. The book fair hosted over 800 presses, journals, and literary organizations from around the world. AWP’s is now the largest literary conference in North America. Location: Sheraton Austin Hotel at the Capitol in downtown Austin, TX. IBPA is the premier educational event for indie publishers and self-published authors. Grub Street, a writing center in Boston, holds its annual conference at the Boston Park Plaza Hotel for three days each spring. The weekend draws over 140 well-known authors, literary agents, editors and publishers. Why you should go: It’s a large conference with more than 800 people on some 100 panels. It’s a good choice if you’re looking to survey multiple sessions or want a conference aimed at all levels. Highlights: The Muse draws a number of top New York agents and editors. For an extra fee, you can pitch them one-on-one by signing up for the popular Manuscript Mart. Don’t miss the Shop Talk Happy Hour for guaranteed face time with agents and editors if you’re looking to land a book deal. The ASJA annual conference is held each spring in New York City. Specifically aimed at freelance journalists and nonfiction authors, the conference attracts some 500-600 people each year. The two-day gathering focuses on helping independent writers survive and thrive as freelancers. Programs include pitch sessions with editors, agents and publishers. Can’t make it to NYC? Regional conferences are typically held in the summer and fall in places like Chicago, San Francisco and Washington, DC. The 2018 edition of BookExpo will be the first end-to-end business solution for the global publishing industry. You will experience, in-person, how content creation, rights trading, retail strategy and consumer behavior will increase profit and give you the tools to succeed in today’s shifting marketplace. 29th session of the Sewanee Writers’ Conference. Thanks to the generosity of the Walter E. Dakin Memorial Fund, supported by the estate of the late Tennessee Williams, the Conference will gather a distinguished faculty to provide instruction and criticism through workshops and craft lectures in poetry, fiction, and playwriting. If you have further questions about the Conference, please contact Adam Latham at allatham@sewanee.edu or 931-598-1654. Location: The Bread Loaf Campus of Middlebury College in Ripton, Vermont. Bread Loaf Writers’ will feature 20 workshops with ten participants in each group. In addition to their literary accomplishments, each faculty member has been specifically chosen for their skill at guiding developing writers. Writers may apply as a general contributor with a manuscript or as an auditor without a manuscript. Thanks to the generous support of Middlebury College and to an endowment fund established by past Bread Loafers and other donors, several categories of financial aid are available for both published and unpublished writers. Financial aid is merit based and a writing sample is required. Carefully planned clinics, workshops and panels help you partner with key players in the publishing chain, and offer invaluable feedback on your creative work. Plus, Literary Speed Dating offers agent meetings for fiction and nonfiction writers, and a private consultation with editors from NYC poetry presses for poets—all included in your registration, which also comes with two vegetarian lunches and welcome coffee & bagels. In our next post we’ll talk about how to determine which conferences are right for you. What to expect and what you need to do to prepare and plan so you get the most out of your investment.